Whether you are a personal brand, a startup company, a mom and pop shop, or a large corporation, social media is immensely useful and effective in helping you achieve your business development and marketing goals. In fact, in today's internet economy, customers and potential clients of businesses and professionals are more likely to do their research about any particular company or business through a quick look at those companies' social media presence. Essentially, the proper usage of social media can make or break your business success, and by utilizing social media in a way that highlights your business' or personal expertise in your niche, you will remain a cut above the rest. 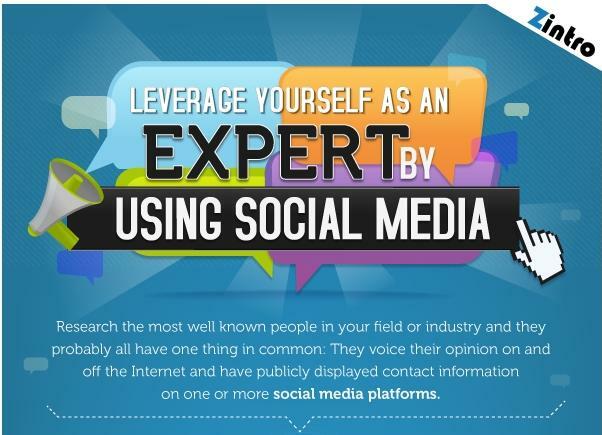 This infographic, Leveraging Social Media to Showcase Your Expertise, describes in detail all of the relevant statistics that businesses and professionals need to know about the top four Social Media platforms today, in order to stay competitive: Facebook, Twitter, Linkedin, and Google Plus. This infographic was created by Zintro, a network of experts. You can find an expert by investment asset class on Zintro.